These ice lollies remind me of my childhood summers: my mum would always make popsicles from pouring yoghurt (YOP – for those who grew up in Luxembourg). She’d just pour the yoghurt into ice lolly molds, pop some sticks in them and freeze them. I remember loving these ‘ice creams’ – unaware of the fact that they were in fact just frozen yoghurts! Who would have known back then that a few decades later, frozen yoghurt would be an actual ‘thing’ – the ice cream of choice for many hipsters and health-conscious people?! 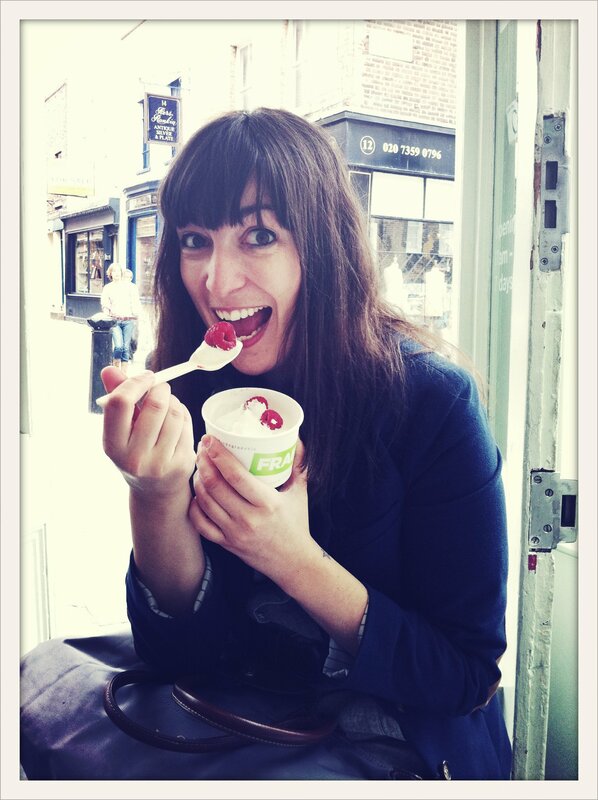 I love frozen yoghurt and I have tried many frozen yoghurt shops on my travels. They do all kinds of flavours these days – from matcha and passionfruit to chocolate and strawberry. My favourite frozen yoghurt flavour stays ‘plain’ though – as it allows you to add lots of yummy toppings onto a quite natural base. 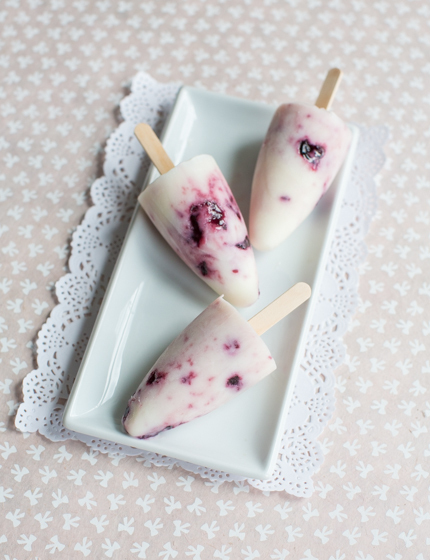 For these ice lollies I’m using plain yoghurt and adding cherry jam to it – the texture is obviously less creamy than the churned, soft-ice versions that come freshly piped out of a machine. Still, it is extremely yummy. You could play around with different yoghurt flavours, add other jams or even chocolate chips, oreo pieces – whatever catches your fancy. The only thing you need are ice lolly molds – but if you don’t have them, don’t despair: just use yoghurt containers and stick wooden ice cream sticks into them! In a bowl, mix the yoghurt with the vanilla sugar and sugar. Fold in the cherry jam, making sure not to mix it too much. Fill the yoghurt into an ice lolly mold with 6 holes. Stick wooden ice lolly sticks into each mold and pop into the freezer overnight. TIP: You can play around with this recipe by using different yoghurt flavours and different kinds of fruit jam.